Scripture (the Proverbs in particular) are full of a particular type of comparison between two things, behind which lies an implied 2 by 2 matrix. 4) Fattened calf with love. Clearly, the best of all worlds would be Beef with Love, and the worst would be Vegetables with Hatred. Because these are obvious, the Scriptural verses which have this structure compare only the two situations in which you get one good option and one bad option. These are the two boxes highlighted in yellow. Proverbs 15:17 indicates that, should you find yourself in this dilemma, you should give up beef before giving up love. For several years, I have thought about the trade-off between the Beauty of Holiness and what I have come to call the Holiness of Beauty. For beauty, being a rare, fine thing created by God, is in many ways a holy thing. The ability to appreciate beauty is part of God's gift of Common Grace, meaning that even full-tilt pagans can appreciate beauty when they see it. In fact, the suspicion with which some sorts of Christians have viewed beauty has led some to wonder if only pagans can appreciate the holiness of beauty. 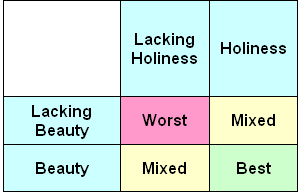 Obviously, if you can manage it, you'd like to have both beauty and holiness (the green box). 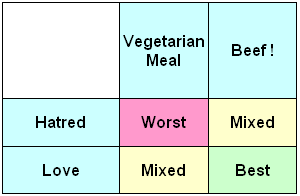 And of course, the worst situation is when you have ugliness and unholiness together the red box). But my mind is drawn to the two yellow boxes, and I am tempted to try to draft my own amateur proverb regarding the two. Better holiness where beauty is lacking than beauty where holiness is lacking. Better the beauty of holiness than merely the holiness of beauty.